When I do a load of laundry I always have socks that don't come out with their match partner! I'm sure this is a common problem for everyone. Instead of just throwing the single sock into the sock drawer in hopes that the mate will show up with the next load of laundry here is what I do: I propped a plastic utility basket up between the top part of the dryer and the wall. This is where I put all the single mismatched socks I find while doing laundry. After 2 or 3 loads of laundry, I go through the basket of socks and pair my sock mates. It's almost like a game for me! I get so thrilled when I find matches. If you have small kids this would be a great task for them - find the matches! I often have socks that never find their mates even after several, several loads of laundry. 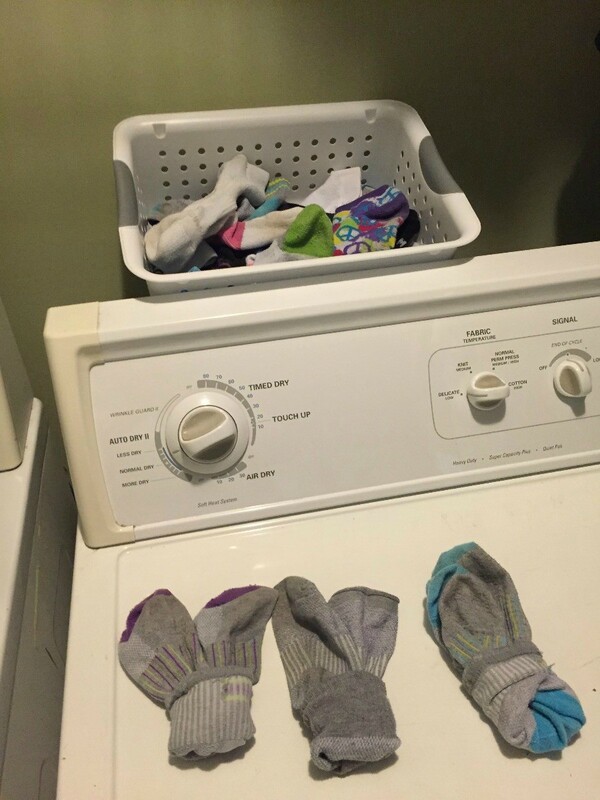 I place these socks in a bag and give them to my daughter. It seems the new teenage trend these days is wearing mismatched socks! Happy sock sorting! I use diaper pins and pin 3 pairs together before I wash them; then they go in the washer and dryer already paired up!